Heat generation is such an important part of surviving. You might look at it as a way to keep the cold at bay from a coming winter. Heat generation is important for much more than keeping you warm. At all times you could use heat to sanitize your drinking water. Don’t forget without heat generation you wont be able to cook that squirrel that is sitting in your snare. Now, there are traditional fire methods that can be utilized to generate heat in a wilderness survival situation. Still, there is a serious cost to heat from wood and you also need to have wood around. What about being in an urban survival scenario where there are very few trees or none left at all. I was challenged to create a Crisco based heating device that could possibly boil water and exude some heat for warmth in the process. This, to me, looked like a decent little experiment to see what kind of heat could be pulled from that little flame and how effective could it be. I have seen heaters built from terracotta and metals screws that took advantage of the small flame of a tea light candle. Of course, it would not be easy to use such a little heat source to do anything that would be highly effective. Still, I was up for the challenge. After deciding to take the angle of an urban scavenging scenario I thought I would look to gather simple materials that would make sense in an urban environment. The Crisco was a no brainer as it was part of the challenge and we all know about the tremendous staying power and light that a wick and can of Crisco can provide. This would be the base heat for the experiment. The quickest way to get a Crisco candle started is to keep a few birthday candles around. I just shove one down in there and we are off to the races. I thought, the average urban survivalist is going to have an easier time finding some small candles or birthday candles in a run down convenience store than they would a random unused wick. These were just pieces of cement we used for another project. They had been sitting in the ground for months. They are inexpensive and something that could mimic the rubble of an urban survival situation following a disaster. The first design was to simply surround the Crisco candle with the large cement pieces so that it could be protected from cold wind and cover it with the cookie sheet. In a matter of seconds the cookie sheet developed a small hot spot where the flame was licking the underside of the metal. I was very suspicious of this little flame and figured our first go round would not prove successful. I placed the pot and water onto the metal and I left the contraption alone for a while. I figured this was no gasifier camping stove and we would need some time to get water boiling. I returned after about 20 minutes to find the water as cold as it was when I left it. FAILURE. After concerning myself with the small candle and its limited heat output I decided to see what would happen if I upped the ante. While it would be breaking the challenge, I just wanted to see how a sterno would do under the sheet. I used a small metal pan to raise the sterno flame just under the sheet. I knew if this wouldn’t boil the water than there wasn’t a tub of Crisco on the planet that would pull it off. After about 5 minutes I returned to find warm water and the telltale bubbles forming around the bottom of the pot. We were getting somewhere. I left the sterno alone for a little while longer and pondered the Crisco dilemma. It seemed that the more powerful flame was just want was needed. Could the Crisco be used for boiling or heating at all? That’s when I thought about the pack of birthday candles I purchased for this situation. What would it look like if Inserted them all instead of just one? 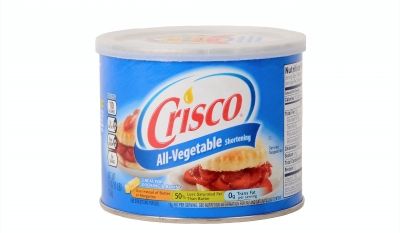 I have only ever seen one candle at the center of a Crisco tub. That’s when I decided to modify a bit. I plunged the remainder of the candles into the Crisco and then replaced the sterno with the new high heat Crisco candle. Even after covering the pot with some camping cookware I was still only able to get the bubbles to rise slowly. Maybe after a few hours the water would have come to a boil but in that time, I could have sanitized my water using the suns ultraviolet rays. The extra candles did create a much more effective heat generator from the cookie sheet. There are some opportunities here. Perhaps the candle could have been raised even closer to the cookie sheet to get direct contact. Of course, too close and we run the risk of putting out the flames. In a cold abandoned room, you would certainly be able to generate heat with about 9 birthday candles, a conductor and something to hold it over the heat. That is the best find in this experiment. It would warm the room in proximity. A metal enclosure with holes might do even better. As far as water is concerned you might be able to make tea but this experiment proved a little too inefficient to produce any strong results for boiling water. The post The Crisco Heater Experiment for Boiling Water and Keeping Warm appeared first on OutdoorHub.